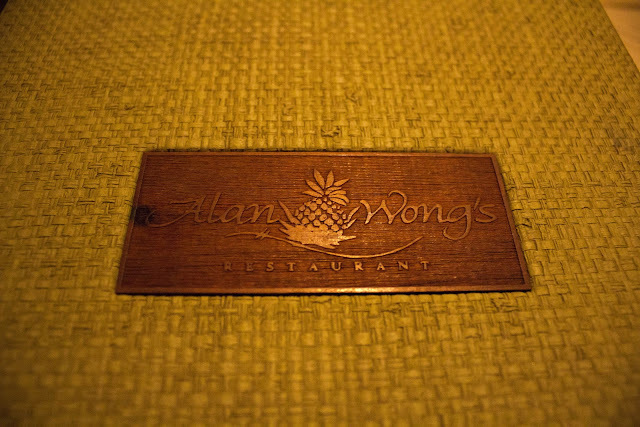 Alan Wong's restaurant would definitely be considered fine dining, despite the casual atmosphere. 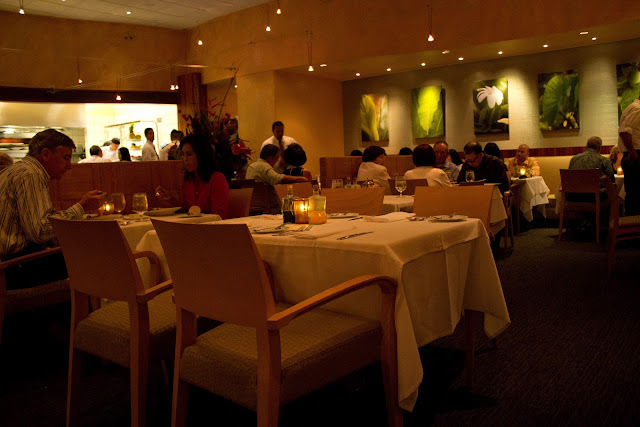 Everything about the restaurant is modern, chic, sleek, and, randomly enough, spring-like. There's suspension lighting strung all around the room, sparse enough to create a shadowed, dim atmosphere, but strategically placed in a way you can see the food that you're eating. The whole restaurant's color palette is made up of light wood and nice fresh spring greens. The floor space is a decently sized one that includes the main dining space and a smaller more secluded glass patio area, where there's a wonderful view of the surrounding city. The ambiance is cool and relaxed and it definitely matches the rest of Hawaii in terms of "rest and relaxation." Alan Wong's is definitely a place to celebrate special events and I must have heard "Happy Birthday" sung a minimum of ten times that evening. 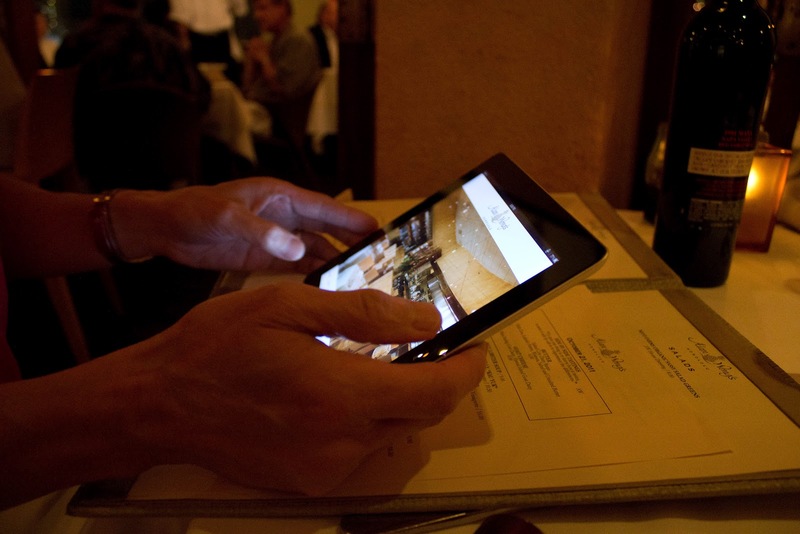 In addition to giving us our celery green raffia menus, we were also given iPads to peruse the drink menu. I love it when a restaurant takes additional steps to make the menu more interactive. Not only was the cocktails, wines, and spirits of the house listed there, but there was a section where they highlighted the farmers that they purchased from and some background information on ingredients. Very fun to burn time on when you're waiting to order or waiting for your food. The restaurant waitstaff were attentive and efficient in serving our food. However, I think the waiter that was serving us that night was having a rough day and he looked really unhappy. My father and I made a few quips in attempt to talk to him, but for the majority of the meal he sort of brushed us off. He warmed up considerably near the end of the meal, but to be fair, the being in the service industry is quite difficult sometimes. My parents and I ordered the tasting menu and my father brought his own wine. Usually I go "ga-ga" about bread and end up stuffing my face with filler before the meal even comes. This time the bread was kind of meh. I wasn't really tempted to eat it. It was served lukewarm with a spicy aioli on the side. I think I was really looking forward to the meal and I didn't want to fill myself up on bread. I've had an embarrassing history of being such a glutton, that I eat so much I feel nauseated afterward. 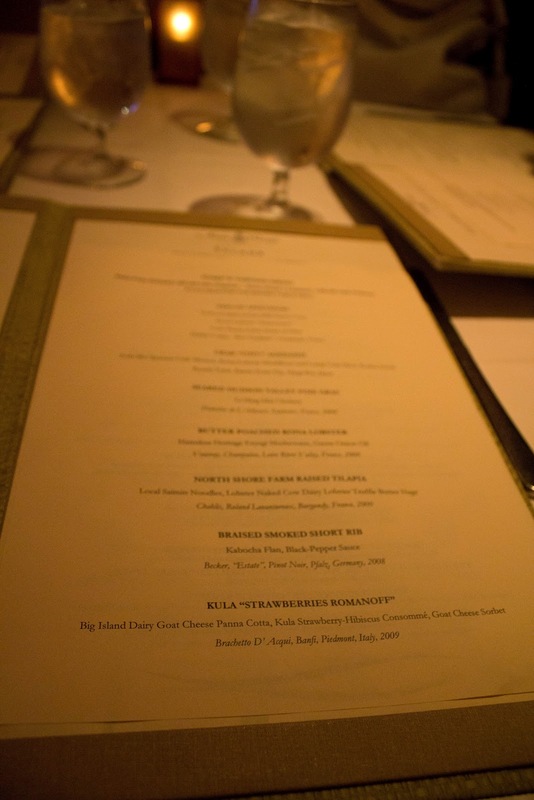 I love tasting menus. I think the idea of getting little morsels of larger dishes individually presented in a beautiful way is sort of similar to the feeling you get when you open up a large fancy chocolate sampler. It's even better when the entirety of the menu actually has cohesion and an overall theme. This little sampler was just the beginning. 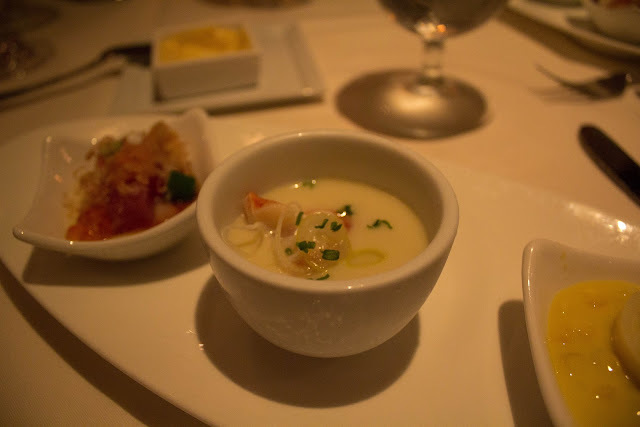 Although, out of the three I only, truly really enjoyed one dish: the Vichyssoise, located in the middle of the plate. A delicious, savory, slightly creamy potato, leek, cream, and onion mixture further embellished with savory bits of kona lobster. I would willingly trade the other two side dishes for a larger bowl glorified potato and leek soup. The two Panna Cotta items were generally mediocre. 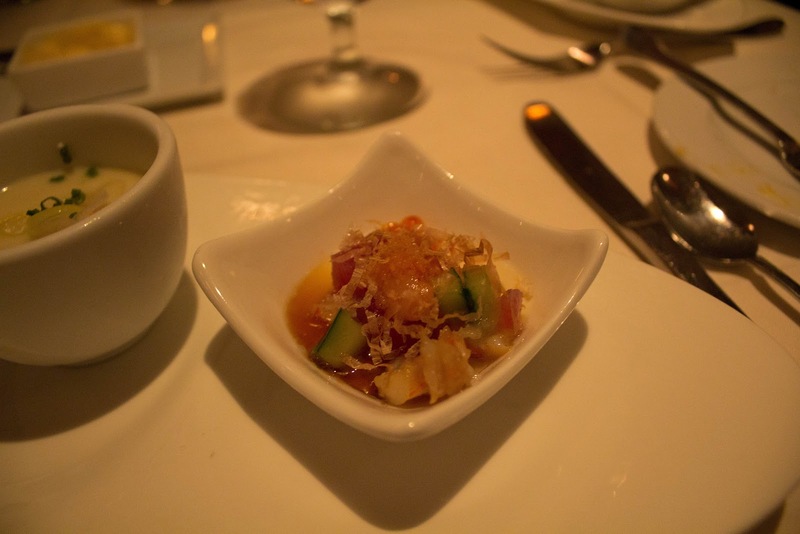 The Seafood Salad was a bright and incredibly fresh, primarily composed of fresh chunks of tuna, bits of lobster, cubes of cucumber, strips of bonito and a light citrus dressing. Honestly, I am mildly allergic to soy milk, so the ingestion of the panna cotta was a little nauseating to me. I personally felt the salad would have done better on its own, but I don't want to give in to my "anti-soy milk" bias. However, I felt justified when my parents agreed that the soy-milk panna cotta didn't really add anything to the initial plate of the appetizers. 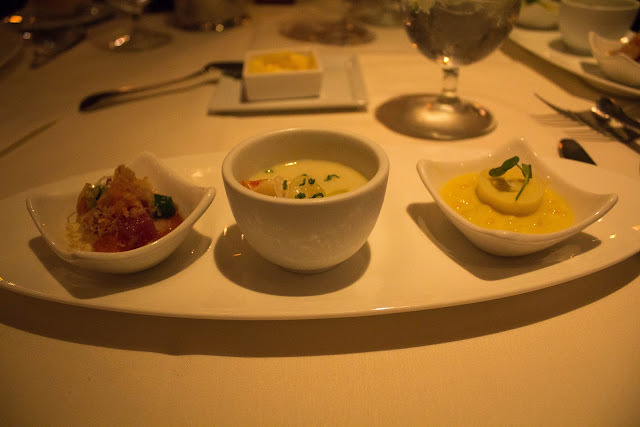 The third panna cotta dish was a corn and heart of palm centric. With this dish what you saw, was what you got: a big glob of sweet, creamy, custard-like corn Panna Cotta, with a nice circle of heart of palm. 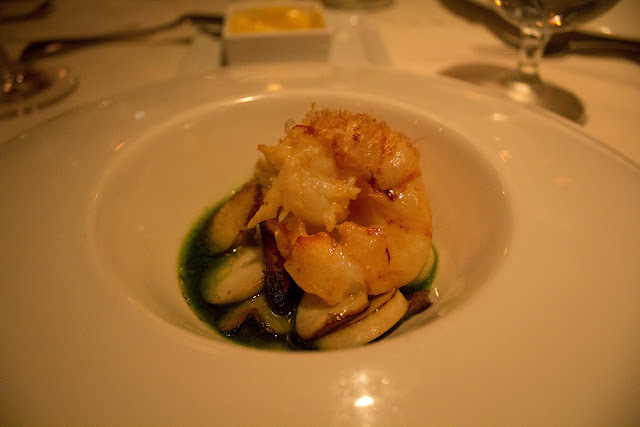 I particularly enjoyed the heart of palm, it tastes like a slightly blander, artichoke heart. Again, in my opinion, the panna cotta supporting the heart of palm was a bit too much, a bit too sweet, and a bit too glue like. 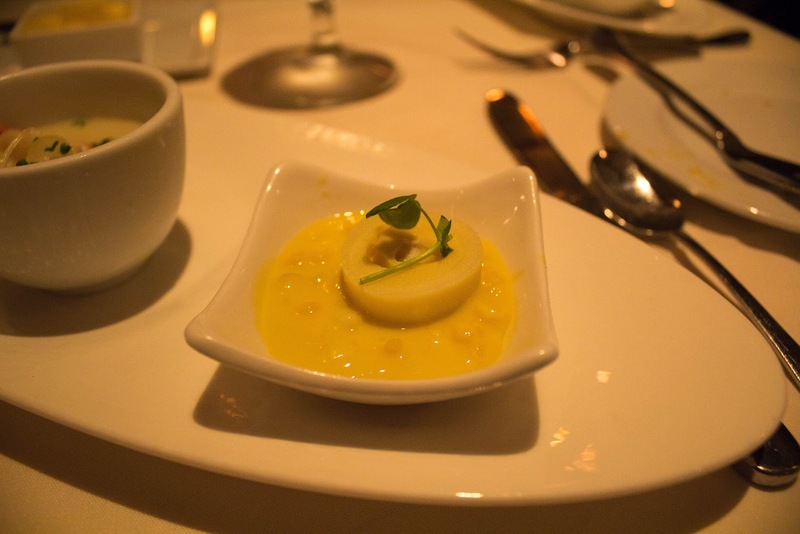 The corn panna cotta was already bland and sweet and pairing it with the already slightly bland heart of palm was a strange combination that wasn't entirely pleasing. The crab tofu agedashi was...interesting. Sometimes you have meals or dishes that you remember forever, but more often than not dishes that don't make a very strong impression on you tend to slip through the cracks. Unfortunately, I feel like this was one of the latter dishes. I remember this dish was very delicate and very light in flavor. The crab mousse tofu, the lobster medallions, and the lump crab meat were all flavored with the Kudzu dashi and a large shiso leaf that served as a garnish. Unfortunately this dish, much like the panna cotta appetizers previous to it, was a bit bland. It was so delicate in taste and flavor profile, that is just read as bland. The third dish we were served was the Seared Hudson Valley Foie Gras. 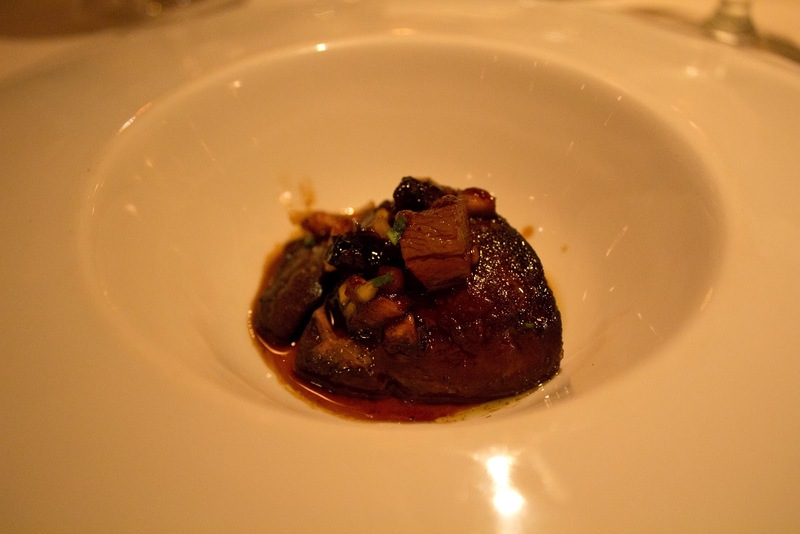 Honestly, I love foie gras, I could probably eat it in all its variations, preparations, and forms all day everyday. When my family was in Paris, I did just that and I actually could feel my arteries clogging up. So, I think a once in a while indulgence is not too bad. ;) Alan Wong's pan-seared the foie gras, sprinkled a little plum chutney on top, and had a dark sweet syrup lightly coating the whole she-bang. I really enjoyed the crust that the searing gave the foei gras, it was a really nice contrast to the pinkish tender middle. 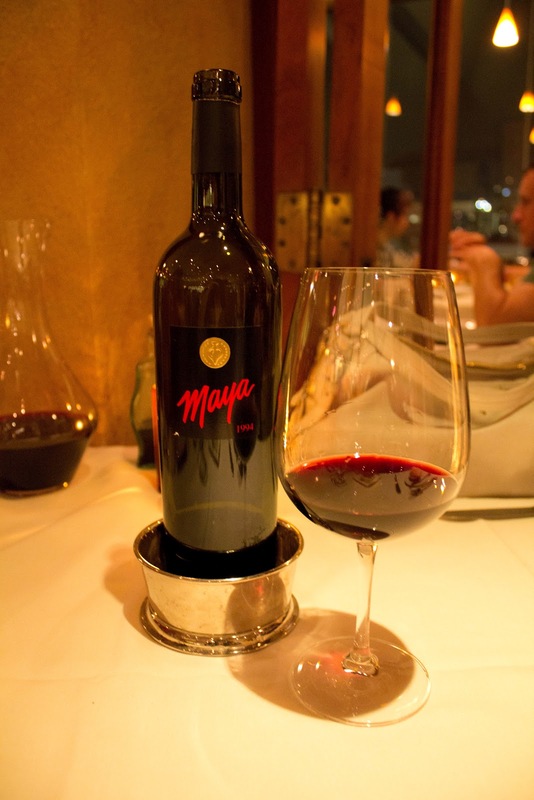 Delicious, although very, very rich with a wonderful savory sweet contrast. Out of all the dishes in the tasting menu, this was by far my absolute favourite. Oh god. My mouth is watering just thinking about it. Previously I mentioned two types of dishes, you guys remember, ones that you remember with ease and ones that slip through the cracks of memory? Yeah this is the former. Every ingredient that was involved with this dish was absolutely perfect and had its place rightfully within its ceramic pedestal. 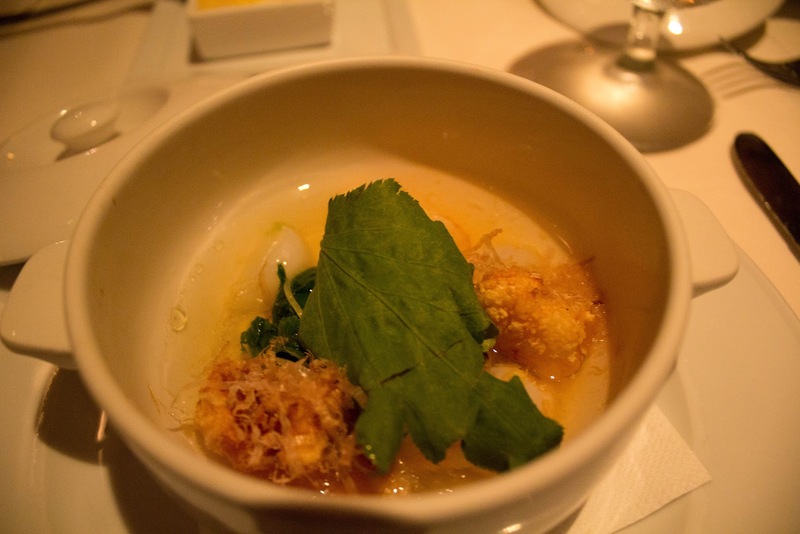 The lobster was so, so, so tender and absolutely packed with a savory lobster flavor. 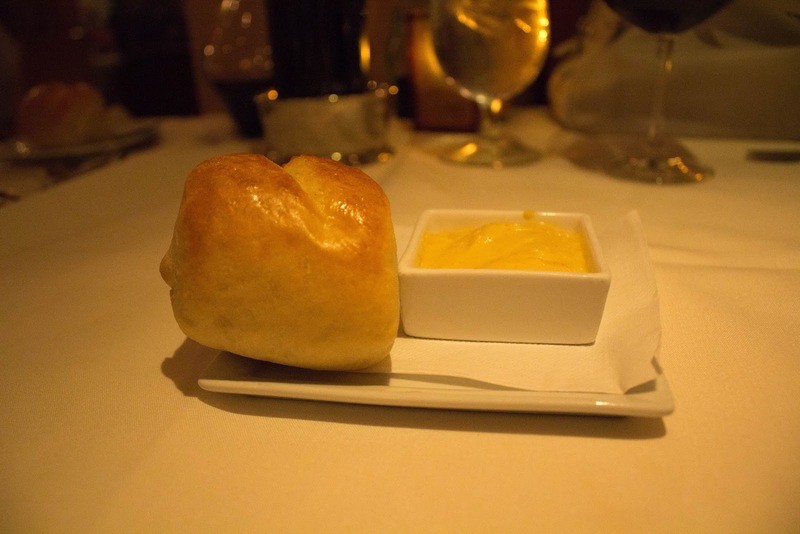 Butter poached anything is just so seductively salty, creamy, and buttery. The green onion oil cut through the butter's oiliness and just gives the whole dish a wonderful light refreshing note. The alchemy that's involved in turning the sharp green onion into a mellow, light oil is amazing. The Eryngi mushrooms also served as the perfect accent to the dish and I particularly enjoyed using them by mopping up the remains of the green onion oil at the bottom of the dish. If I could, I would probably get this as a main. It was so good. Tilapia is one of the most eco-friendly fishes, but also one of the more tasteless ones. I think tilapia is prized for its (debatable) nutritional content and its neutral flavor. 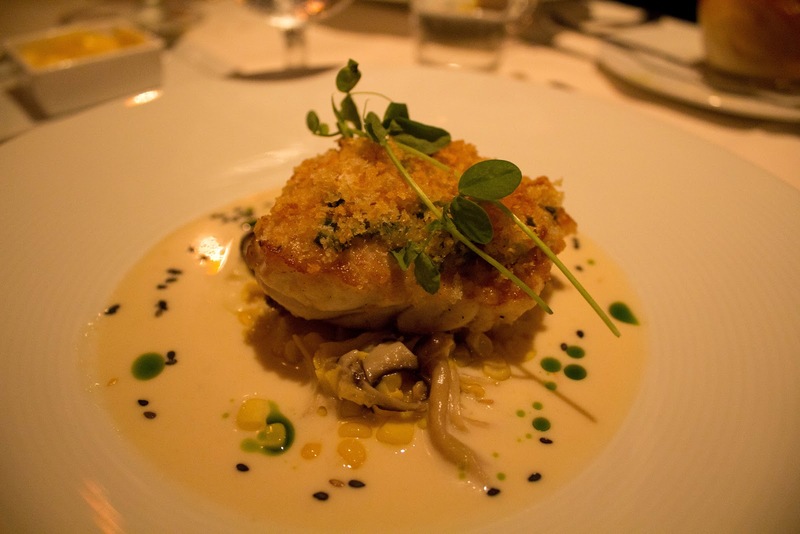 The overall composition of the dish was actually quite a lovely one, the crust on the fish was crisp, the sauce was creamy, the truffle butter was potent, but not overpowering, and the mushrooms were an absolutely lovely compliment to the fish and the sauce. My only complaint about this dish was that the fish was a little bit overcooked and, as a result, was a little too dry. The sauce was a good way to alleviate the dryness of the fish, but as a diner you could tell that they had meant for the tilapia to be perfectly cooked and moist. 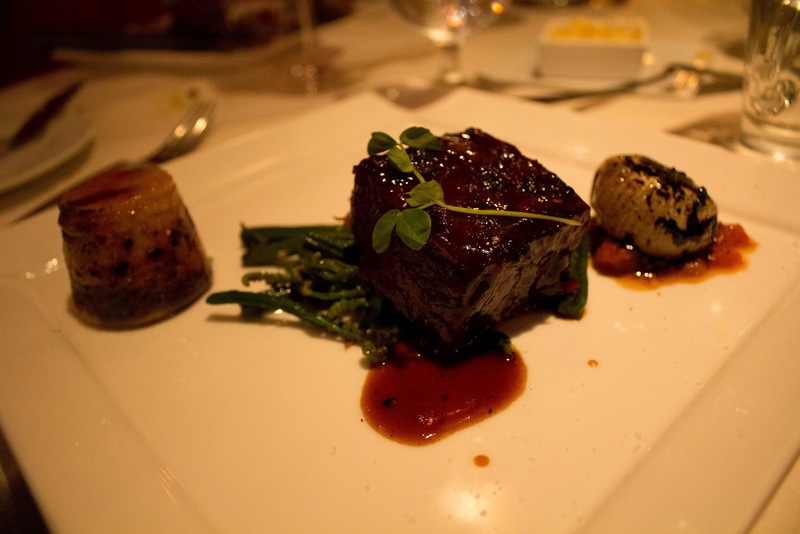 The braised short rib was very delicious and straddled the line between savory and sweet. It was a good peace of meat! 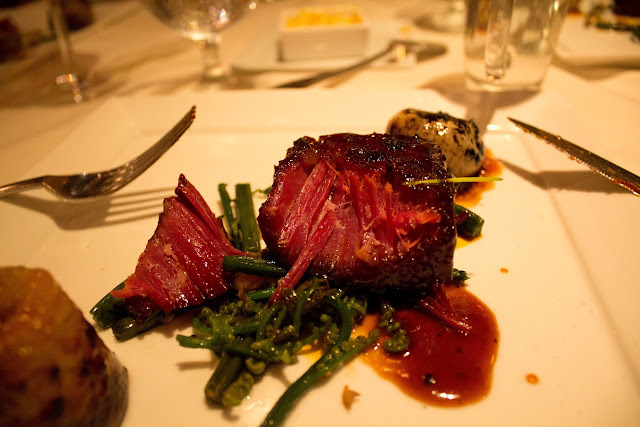 The vegetables surrounding it were well matched and the greens underneath the short rib were ones that I was familiar with. I think they're part of the fern family, but the only reason I readily recognize them is because of their distinctive form and texture. Every time I've had these little greens, I've noticed that they have firmness and a characteristic sliminess when you eat them. Isn't that strange? The sliminess isn't too unappetizing, but I know it can be off putting to some people. As for the Kabocha flan, it was very starchy and had the texture of firm mashed potatoes. I love Kabocha squash on its own, but here in its flan form it's very sweet and provides a nice starchy accompaniment to the meat. In terms of the meat I was pleased, but also disappointed. The flavors were good and the sides were well done, but again, as with the tilapia before it, the short rib was a bit dry. The short rib was fork tender, but I really did expect more moisture to be locked into the meat. The meal started with panna cotta and so we ended with panna cotta. Although, I'm not usually drawn to panna cotta on the dessert menu, I much prefer the richer, creamier, more chocolatey things, the light panna cotta at the end of a relatively heavy meal was quite refreshing. 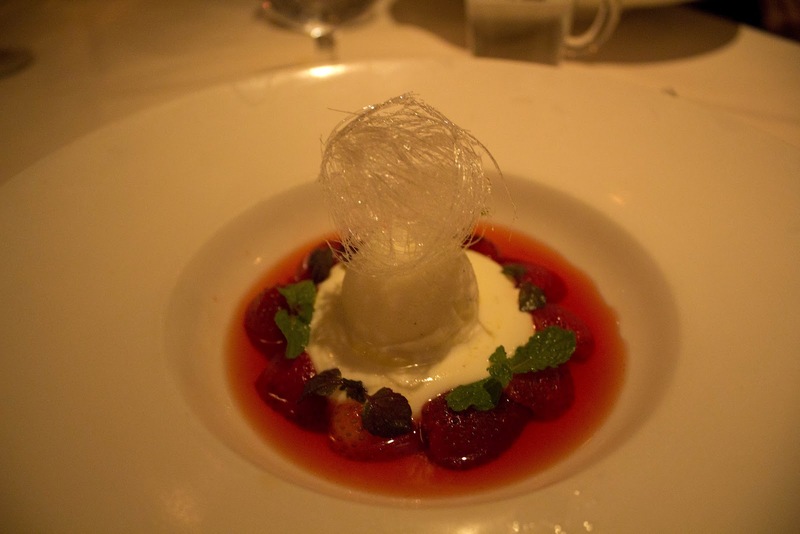 The Goat Cheese sorbet was tangy, the cream of the panna cotta mellowed out the sweetness of the strawberry and hibiscus consomme and the flavors blended wonderfully together. The spun sugar at the top was a nice textual element, but I think it looks a little bit silly in terms of design. The dessert at the end of the meal was perfectly placed, not too heavy and the freshness of the mint, light sweetness of the strawberries, and tang of the goat cheese had a wonderful contrast to the rest of the meal.